I loaned my buddy the artifacts so his Ghostrick deck could have a better Majespecter match-up. Artifacts however do nothing against Kozmo and failed to prevent me easily taking game 1. Game 2 he opened a horrific brick that I’ll do my best to show using my sub-par artistic talent and bulk cards lying around. He topdecked Allure and blind-allured into Terrorop and a trap losing both. It wasn’t pretty. I may have been hard on him for his misplays, but now the guy has been triggered by the number 6 ever since. Feels bad man. So game 1 I am knocked to 100 life due to Manju and Herald keeping my pilots from ever making themselves relevant. I set Ghost Ogre and Vanity’s. I flip Vanity’s at the one instance he somehow has no fairy in hand. His Manju, Herald and Gale Dogra are stalled by my 2 Strawmen and Ghost Ogre until he realizes he has no outs left in deck and surrenders. Game 2 he assembled his combo (Alongside everyone’s favorite Archlord Kristiya), so I didn’t get to play. Game 3 I put Dark Destroyer out in response to his first ritual spell, but I never saw him using Star Seraph Stick and Chair to make Utopia S39 into Utopia the Lightning to run over my destroyer and defeat me. So earlier today my the same Blue Eyes and Yosenju Kaiju player got me to join them in hitting up the nearest Yugioh OTS store (outside of Philly of course). Thus a new not local locals occurred. My opponent set a monster and passed. I set Vanity’s and do something mulliganing with Kozmotown. He normal summons Breaker, the Magical Warrior. I drop Dark Destroyer in response to its effect to add a counter to destroy it. I add back Farmgirl and attack him with it. I make Cyber Dragon Infinity in the second main phase. He normal summons Skilled Dark Magician and attacks my Farmgirl. I absorb Skilled Dark and attack him for game. Game 2 he opens the exact same cards. I played against the same guy who single-handedly sullied my last regional experience by being ridiculously rude during our match. Game 1 he drops Dark Law + Rafflesia, but I use Raigeki to crush them both. He never recovers and I take the game. Game 2 I sided to go second and he makes me go first. I put out a turn one Cyber Dragon Infinity, but he Kaiju’s it and defeats me on his 2nd turn. Game 3 I lose to Phantom Knight Wings protecting his Masked Hero Acid after we both lose all of our resources. I lost all respect for myself after this game. I misplayed amazingly and still somehow won due to my opponent both not knowing how his cards worked or how to pressure at all. So I had 1900 life. I normal Soartrooper, reanimate a 2nd one from my grave. Realize I have like no life. Etele into Farmgirl, make Breaksword to break my Kozmotown and his Dark Magic Circle. Search my deck only to realize I put Dark Destroyer in grave turn 1 and that I can’t run over his 2800 Magician of Dark Chaos (with no spells ever placed in his grave). I put Dark Lady in defense and pass. Dark Chaos runs over Breaksword taking me to 100. I topdeck raigeki for the Chaos, but fear something attacking Dark Lady for game so I stay in defense and set tincan. He passes. I topdeck Kozmojo and attack with Lady, and pass. He sets Eternal Soul, attacks with Magician Rod and I Kozmojo it. I topdeck call of the haunted and set it. He activates Eternal Soul in his main phase, but I pop it with Slipridder destroying his board. I swing for game on the next turn. Anyway he lost on the 3rd turn. I rematch the dang Masked Hero guy. I was beyond done with this dude, but I accepted reality offering me yet another chance to try and defeat him. Game 1 I win off a Dark Destroyer popping Dark Law only to get hit by Rafflesia’s Floodgate Traphole. However from there I win off Farmgirl direct attacks. Game 2 I’m forced to go first and open MST x2, Call of the Haunted, Storming and Slipridder. He twin twisters the Storming Mirror Force and then kills him. topdeck Tincan, adding Forerunner and next turn drawing Instant Fusion to Castel away his defending Masked Hero Acid for game. The heart of the cards were literally on my side. I against didn’t deserve this. Thus, I got 2nd place winning 5 packs. Anyway, I pulled a Solitaire which is $5, which was the entrance fee. Breaking even at its finest. I mess 2013 yugioh where games didn’t end by turn 3. I mess yugioh that seemed fair. Also once Toadally Awesome comes out next yet (as the Hero guy pointed out way more than once) the Masked Hero deck would actually become meta and thus more unfair turn 1 lockout boards with exist. I’m legitimately considering going back to MTG Standard. After a long time of playing Nekroz, I retired my ritual spells to try playing something more meta. I chose Kozmo as I had most of the pieces lying around. Now I might as well admit to myself that after attending Yugioh locals for the past 3 weeks that I’m more or less back into competitive Yugioh. Well I really love Force of Will EDH (60-card singleton) Epic Stories Format, but I have no desire to buy more into the game or play it remotely competitively. I’m getting closer to a solid EDH deck though I’m still playing 5-color Planeswalkers, but with better power cards and tutors. So the first iteration of “jank” Kozmo I cut he Dog Fighters and Black Gardens to add in a bunch of traps. This deck on the upside had enough traps to hold back combo decks, BUT it bricked like crazy. My opponent had a real DDD deck with Pot of Desires. I opened all my traps and literally hindered him until I drew Dark Destroyer. Nothing DDD had could play around Destroyer in hand to disrupt his play. Wave King Caesar however was a clean out to Kozmo ships. Somehow we go into time game 1 and I win off of Wind-up Zenmaines + Goodwitch while my opponent had 3 cards left in deck. I take game 1 using the same Dark Destroyer trick. Lose game 2 to an established board and then go into time again game 3. I win in time again. Only highlight was match was that my opponent baited my Cyber Dragon Infinity to force through his Pot of Desires. Game 1 I don’t remember what happened, but I lost. Game 2 I opened Soartrooper, Strawman x2 Town and Call of the Haunted. I mulliganed with Town into nothing and lost the next turn. Took game one, got OTK’d game 2 and lost to Solemn Warning game 3 when I couldn’t get my hand empty to avoid Trishula. Deck was a pile of traps without Demise essentially. 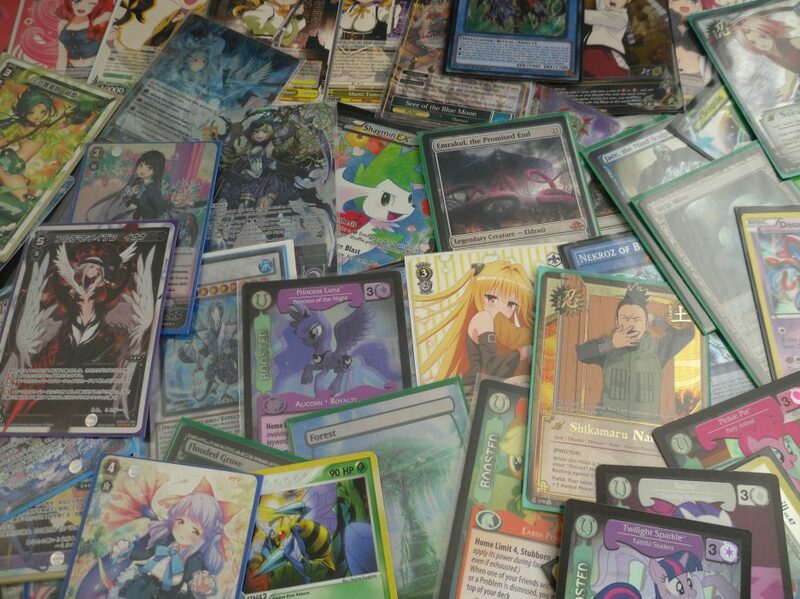 Yeah I left a pile of my cards at home so I had to make a deck with cards I traded for/bought at the venue. I take game 1 using the “fair and balanced” Dark Destroyer. I lose game 2 to Wind-Up Kitten plus Kaiju. I lose game 3 to the same combo after bricking. I don’t remember what happened other than Cyber Dragon Infinity showed up and I didn’t last long. This was a rough night due to misplaying a lot of my cards. It was a miracle I did as well as I did. I know it looks so much more legitimate right? After 2 weeks of pain I forced myself to buy the Tincans, Dark Lady and Mojo (good deals IRL and on ebay for each). He bricked and I got into Cyber Dragon Infinity off Sliprider + Panzer Dragon. Game 2 I opened my Ghost Ogre and D.D. Crow. I ghost ogre his Galaxy Soldier and D.D. Crow his Galaxy Soldier in grave. He makes Lancelot Knight of the Underworld. I force its negate using Instant Fusion then use Soartrooper to reanimate Dark Lady then I control the game from there. Game 1 he has total control only risking the match up by making Cowboy (while I was at 200 life) I flipped a Torrential destroying my set Landwalker. I had to set said walker to play around Majespecter Tempest. Still I no longer have the life to do anything so eventually he gets back his board and takes it. Game 2 I have the board control of Dark Lady + Dark Eclipser, later into Eclipser + Vanity’s. I ended up losing to Tin Can turning off my own Vanity’s. He makes Utopia the Lightning and I lose everything. Game 1 I I lost to #95 Dark Matter + Vanity’s Emptiness staring down a defense mode Tin Can. We both bricked game 2, but I mess up neglecting his Return of the Dragon Lords in grave wasting my Utopia the Lightning. He pops the Utopia and gamed me the next turn. My results aren’t great, but with the power level of my deck I’m amazed to have won any games at all. I’m slowly learning how this deck works in the hopes of transitioning from a Kozmo player to an actually good Kozmo player. The deck isn’t as easy as it seems and while the decision trees aren’t that diverse it still hard to play correctly. I’m nowhere near good with this deck (and I have no desire to drop $60 on Card of Demise or even $30 on Allure of Darkness), but I’ll make due with what I have. It’s been a very painful, but engaging couple weeks of Yugioh.